I’m excited to introduce you to another company who will be showing work at the Printsource show in August, Creativo. If you will be attending the show they will be in booth E-6. We’ll be neighbors! I’m in E8. So you will definitely have to check out the E aisle! Further down you’ll be able to visit Peagreen. I picked some of my favorite bold and fabulous Creativo prints to feature here. Check out their site to see more. How long have you been in the surface pattern business? 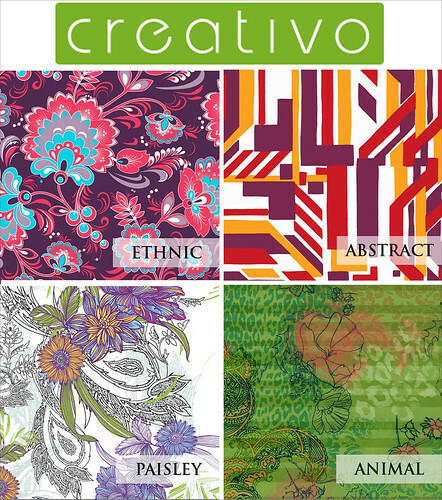 Creativo had a total combined experience of over 45 years in the surface pattern design business. Our designs sell to various markets from apparel, paper goods, accessories and home furnishing markets. Our company started with 11 designers from around the world who had the need to expose their work to big established companies and smaller specialty stores in the US, Australia, Europe and South America. Do you work from personal points of inspiration or follow trend watching sites? We use multicultural inspirations since we have a wide range of artists who are established as designers in their own countries. As a team, we always research the market thru different sources such as shopping the markets in Europe and the US. If you use trend watching sites for color or motif ideas would you please list your favorite sources? Market research only and hand drawing technique ideas from our talented designers. Anything else you would like to share with Maquette readers about you & your designs? Creativo is known for its unique surface designs and is a trailblazer in the digital surface design industry. Our design team brings to the table a higher understanding and analysis on up and coming textile trends as well as placement graphics. For this reason, our seasoned design staff can successfully guide our clients through every aspect of each project to ensure that the quality and consistency represents their vision and overall company brand. Thanks Danny! Can’t wait to meet you all at the show! 6 Responses to Creativo Surface Design Co.
Hi Samantha. Thanks for the interview. The show is right around the corner and we can’t wait. just wish we had more time to prep……the summer flew by! glad you like them too…. I love how bold and crisp they are….